FOUR CRAYONS,The Decoda Cello Quartet - ( Saturday, January 21, 2017, 1pm) - Join String Theory and the Hunter Museum for a special family concert featuring Four Crayons, a show that asks the question, how does the sound of the cello help to create a musical picture? 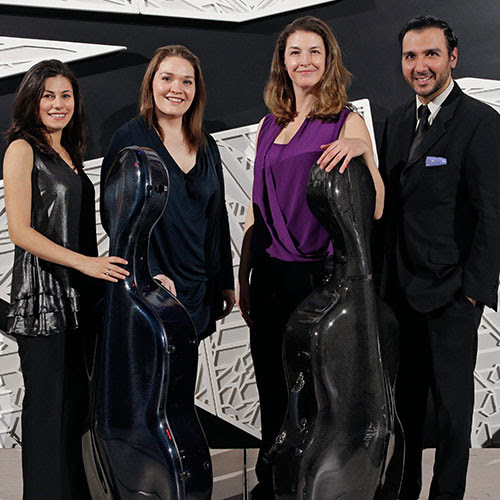 The Decoda Cello Quartet will show how much versatility of sound is possible when drawing from four of the same instrument. By exploring the tools composers use and the choices they make, we hear how four cellos can create a number of vivid musical settings, and beyond. This concert will be followed by an instrument petting zoo hosted by the String Theory Youth Initiative!